Sugarpova is a line of premium candy that was created by international tennis star Maria Sharapova. Fun, fashionable and sweet, Sugarpova candies is a bit luxurious, a bit classic, and a lot of tastiness! 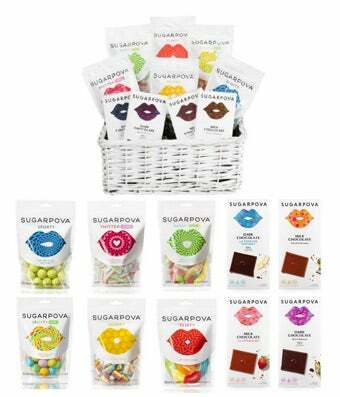 This signature gift basket includes 10 product assortment of Sugarpova gummy candies, chewing gum and chocolate bars.These premium candies are Non-GMO, Certified Kosher, Halal and made with all Natural Ingredients.